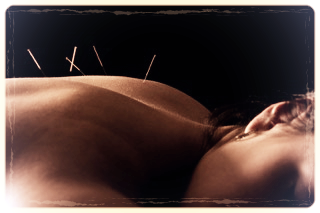 Acupuncture is the gentle insertion of tiny, disposable, sterile needles. Acupuncture points are selected in order to regulate the vital energies of the body. What do we mean by regulate? Many health problems manifest as excess or deficient, with symptoms of heat, cold, dryness, excess phlegm or fluids, stagnation, or pain. Acupuncture treats symptoms while getting to the root of the problem as well. This can eliminate pain and restore balance and harmony, as well as the body’s ability to heal itself—ultimately leading to optimal health and well-being. Topical treatments such as fire-cupping, gua sha, and the use of moxa (aka the herb artemis vulgaris or mugwort) are used in conjunction with acupuncture. Cupping and gua sha are topical treatments of deep seated obstructions within the muscles and adjacent tissues to help eliminate pain, expand movement, improve blood circulation, and improve organ function. Fire-Cupping involves applying a glass cup to the skin with suction over an area where there is muscle pain, decreased sensation, coldness, or limited movement. Cupping moves blockage in the tissues that have built up as a result of injury, illness, or poor circulation. The suction action restores adequate blood flow to the area, accelerating the healing process after an injury or illness. Cupping is also used in early stages of colds and respiratory infections to assist in clearing the pathogen from the body. Gua Sha is a technique in which an oil is applied to the skin over an area where pain or limited function occurs. Then a flat edged gua sha tool is rubbed over the area with pressure, releasing tight, painful, numb, contracted muscles and tendons. Gua sha can also be used to release congestion and toxins from the lungs. Moxa is used externally to warm the body, invigorate blood flow, and dispel dampness and cold. Two forms are used: the smokeless stick, and indirect moxa applied to the needle handle. It substitutes for prolonged hand maneuvering. Electro-acupuncture may also help reduce total treatment time by providing continued stimulus. It can produce a stronger stimulation without causing tissue damage associated with manual manipulation of the needle. Strong stimulation may be needed for difficult cases of neuralgia or paralysis. Herbal Medicine is the use of plant seeds, berries, roots, leaves, bark, flowers, mineral, and animal objects for medicinal purposes. Chinese herbal medicine usually consists of combining two or more herbs into formulas instead of using single herbs. While the scientific study of herbs began just over two centuries ago, CM formulas have been used to treat a wide range of health problems in Asia for thousands of years. Modern doctors of CM use herbal formulas which were created, recorded, and effectively used thousands of years ago and today. To Schedule and acupuncture session online with Kim click the button below!